A pond can be a scary undertaking if you have not had one before. 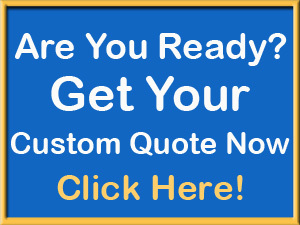 With a little bit of help from an experienced pond contractor you will find the process easy. It is important to first decide what kind of pond you want. To you want Koi or pond fish like goldfish and minnows? Do you want aquatic plants like water lilies and bog plants? 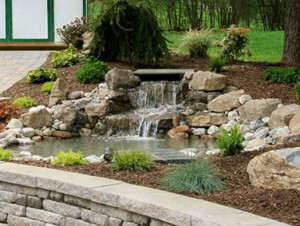 Do you want to do some of the pond maintenance yourself or have a filtration system that will do all the heavy lifting for you. In the pictured pond it is equipped do have all of the above. It is referred to as a Hybrid Pond. Hybrid ponds incorporate everything into one pond. Hybrid ponds can be fairly deep. 3 to 4 feet deep is common and will accommodate a nice selection of Koi comfortably. Water lilies if well established will thrive in the deep areas of your pond. It will have shallow shelves for your bog plants. Usually at 12-14″ deep. This pond like most hybrids will have a filtration system. This system will include a skimmer, filter ( either in pond or exterior) and if budget allows a U.V. unit. Important point to mention is all filtration must be left on 24 hours a day with no exceptions. This type of pond gives you many options. It will then be up to you.. Fish no fish. Plants no plants. 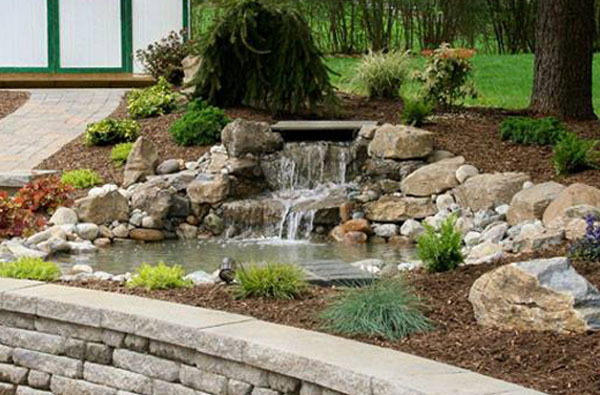 Build your pond and enjoy!! It will be the cornerstone of your home and the gathering spot for your family and friends.